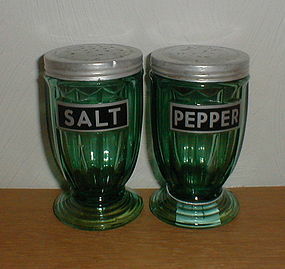 "Jennyware" ultramarine Salt & Pepper Shakers, both in excellent condition with no damage. 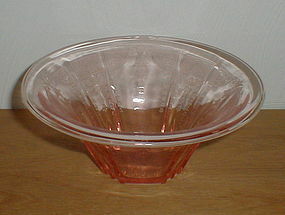 Lids do show some age and wear, but are still OK.
Mayfair, pink, Water Set. 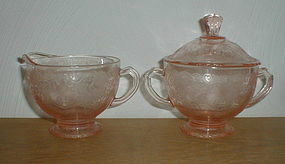 Pitcher and 8, 4 1/4", 9 oz. 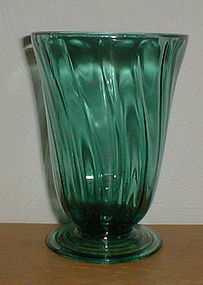 tumblers, all in excellent condition with no damage or use marks. $90.00 for the Pitcher. 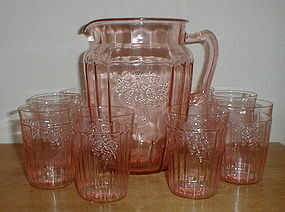 Pictured tumblers are sold. 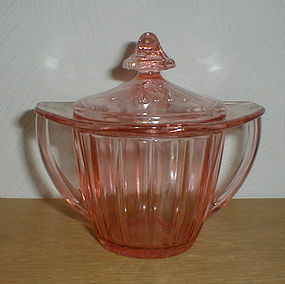 Pink Adam Sugar with Lid, both pieces in excellent condition with no damage. 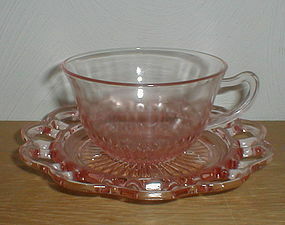 Florentine #1, pink, Creamer, Sugar & Lid, all pieces in excellent condition with no damage. 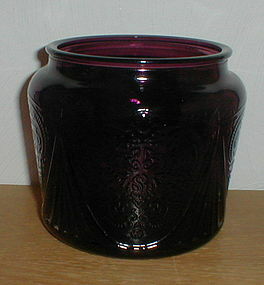 Amethyst, Royal Lace, Toddy/Cookie Base in excellent condition with no damage. Swirl/Petal Swirl, ultramarine Footed Tumbler in excellent condition with no damage or use marks. 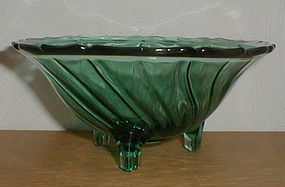 Ultramarine Swirl/Petal Swirl 3 footed Candy Dish in excellent condition with no damage or use marks. Ultramarine Swirl/Petal Swirl Creamer & Sugar, both pieces in excellent condition with no damage or use marks. 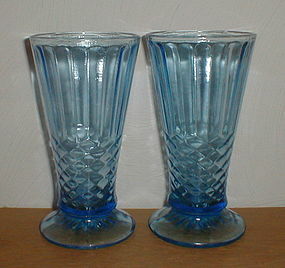 Two, blue, footed, Aunt Polly Vases. Both are in excellent condition with no damage. One is really nice, $50.00. The other also has no damage but does have some fine straw lines from the manufacture. $40 for this one. 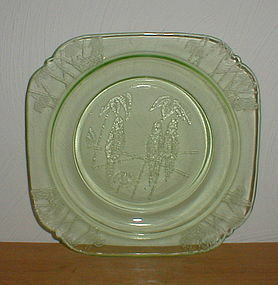 7 1/2" green Parrot Salad Plates. All in excellent condition with no damage or use marks. Four are available. $30 for one or $50 for two. 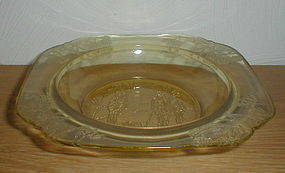 7" amber Parrot Jam Dish in excellent condition with no damage or use marks. Identical to a butter bottom except the jam dish doesn't have the ridge to hold the butter lid. Two are available. $60.00 for both. 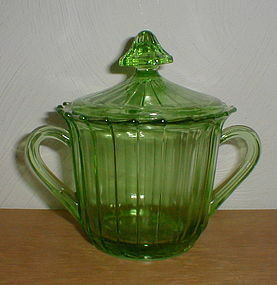 Sierra (Pinwheel) green Sugar with Lid, both pieces in excellent condition with no damage. Old Colony pink Footed Sherbet. Nice for display but not quite perfect. Has one chip on the underside of the outer edge and a couple of cooling cracks in the edging. Still looks nice and priced way below normal retail. 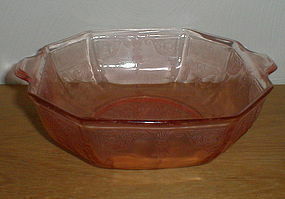 Princess pink 9" Octagonal Salad Bowl in excellent condition with no damage. 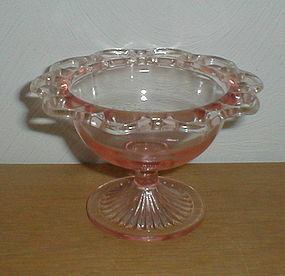 Princess pink 9 1/2" Hat Shaped Bowl in excellent condition with no damage. 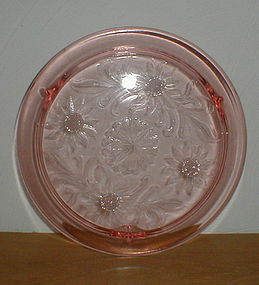 Sunflower pink footed Cake Plate in excellent condition with no damage or use marks. 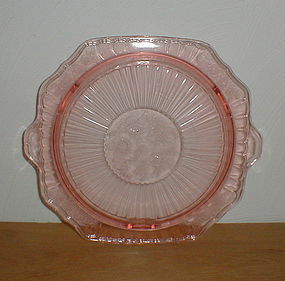 Open Rose/Mayfair pink footed Cake Plate in nice if not quite perfect condition. Excellent except for a small chip on the upper edge of one handle.